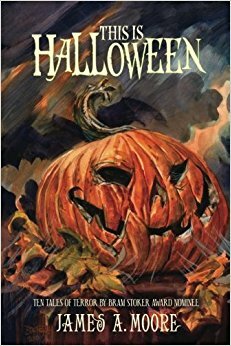 I've written before about how Halloween just isn't Halloween without Ray Bradbury rearing his head somewhere. This year he came in the form of a revisit of his classic YA novel. 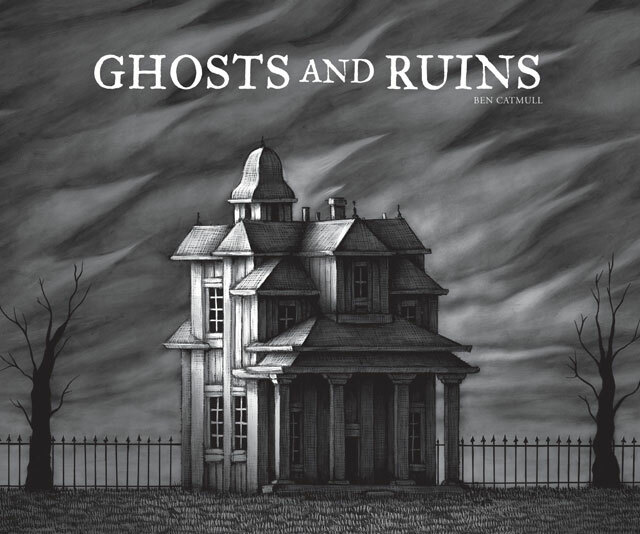 On Halloween night a group of costumed boys finds themselves being towed along by the sinister Clavicle Moundshroud as he takes them through time on a tour of human's history with death and mourning. All the time they are chasing their imperiled friend culminating in a Faustian deal to save him. 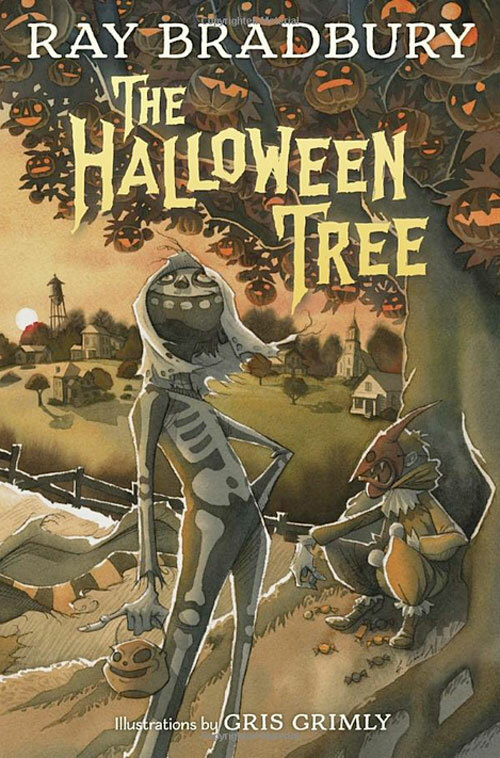 Slight as a story, The Halloween Tree, is one of Bradbury's tributes to eleven year old boys, written as only he can write it. This edition comes with suitably seasonable illustrations by Gris Grimly. If you've never read it before, you really must. Seabury Quinn wrote 92 short stories and one novel starring his paranormal adventurer, Jules De Grandin, and his "Watson," Dr. Samuel Trowbridge. Originally published in Weird Tales, these adventures of the "occult Hercule Poirot" were more popular than the stories by, now, better known authors such as Robert. E. Howard and H.P. Lovecraft which were being published alongside them. 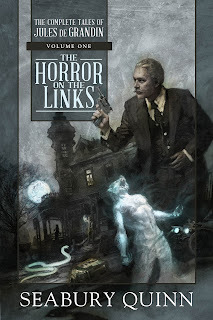 The stories range from mysteries involving giant snakes, possessed apes, ghosts, werewolves, vampires, ancient goddesses, deities, and spirits, and pretty much anything else you can think of. Despite the variety of subjects, the stories tend to follow a regularly repeated formula, which probably helped maintain their popularity when the tales were spaced out at least a month apart. It was a great way for regular readers to refamiliarize themselves with these characters and their exploits, and for new readers to be swept up in them for the first time. What this means for the modern reader though is that reading them back to back is not recommended. You really need to pace these out unless your plan is to tire of them quickly. I've been a fan of Jules De Grandin since first encountering his exploits in a group of six slim paperbacks published by the Popular Library in the late 1970s. But these represented only a small handful of the total adventures. An expensive limited hardcover collection of all the stories was briefly available at the turn of the 21st century, which, at the time, was out of my budget. Thankfully. Night Shade books is gathering all of the stories in chronological order in five beautiful hardcover volumes, the second of which should be out by the time you read this. Orrin Grey is one of our fellow crypt keepers at the Countdown to Halloween . 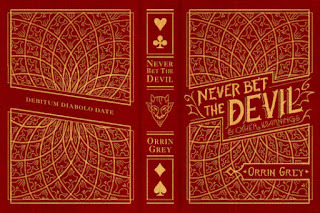 Never Bet the Devil is the first of two short story collections that he's published thus far (Painted Monsters, being the second). It has recently been republished in a gorgeous limited edition hardcover, with an additional story not included in it's initial publication. The stories are all outstanding. Grey is much more interested in conveying the strange and peculiar tropes of horror than the "horror," and I have no problem with that. It's as if someone handed Grey a big trunk full of essential elements of the genre in toy form and he's having a blast playing with them. I find his enthusiasm contagious, and watching what he's done with these toys was almost as much fun as playing with them myself. The stories vary in length, but include disturbing artifacts, giant slumbering old gods, strange experiments, unsettling artworks, monsters of all kinds, creepy old houses with mysterious basements, and the devil incarnate. 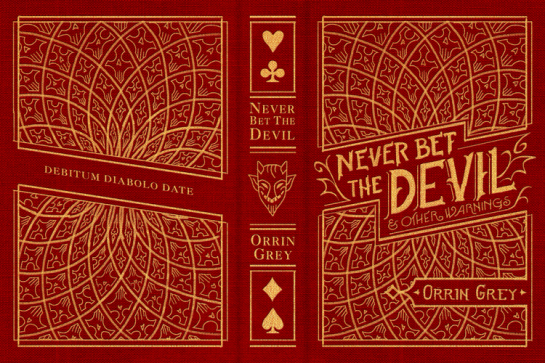 Never Bet the Devil makes for perfect Halloween reading. One of the notions about the horror genre is that it's filled with stories that require people to made bad decisions in order to succeed. Don't go in the basement. Don't split up. Call the police. Advice that goes unheeded and leads to tragedy. Ed Logan, is a college student recently dumped by his girlfriend. In his grieving for his dead relationship he makes a lot of bad decisions, but since this is a first person narrative, we are privy to the thought processes that lead him there. Ed being 20 years old, there is an inner logic to many of his decisions that, while still bad ones, almost make sense in hindsight looking back to being a former 20 year old whose love life had its bad bumps. At any rate, his choices keeping steering him from the safety and potential of a new relationship with a more than suitable young woman and into late night walks that bring him into the bizarre nocturnal world of the town he lives in, with a creepy old woman in spandex on a bicycle, homeless people with unusual eating habits, a extremely threatening sexual predator, a house stuffed with disturbing memorabilia, and the other girl, a reckless free spirit who has a hobby of home invasion. Comic book legends, Ostrander and Mandrake have had this project on the back burner for thirty-years. Now, thanks to a successful Kickstarter campaign, the graphic novel is a reality. Kros: Hallowed Ground is set against the backdrop of the Battle of Gettysburg, a series of bloody battles in bloody war that have attracted vampires to feed on the blood of the fallen soldiers in this conflict. It's also attracted Elijah Kros, a man fighting his own war, not against the North, or the South, but against the vampire hordes. Kris is a Dampyr, a living man with many of the attributes of a vampire, and enough of the temptations that in his weakest moments could lure him across the dividing line from his righteous path to becoming the very thing he hunts. 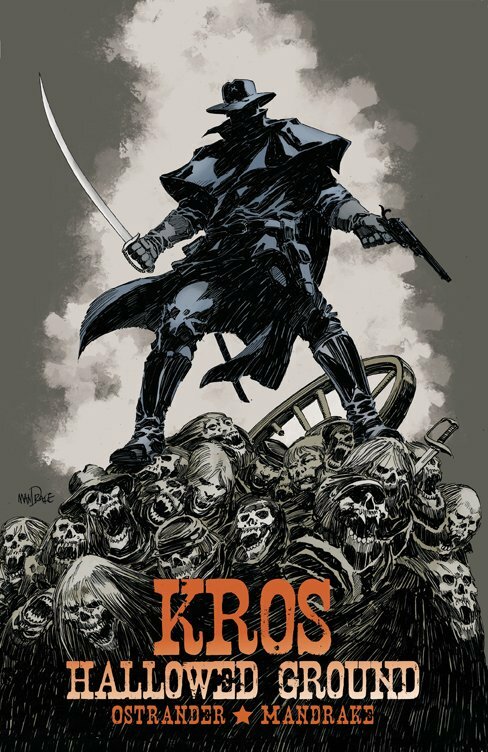 Ostrander and Mandrake are master storytellers with decades of experience accumulated between them so it's no surprise that Kros: Hallowed Ground is a well told tale. Stranger's writing is tight, fast paced and succeeds in conveying a lot of information and character compactly. Mandrake's art is simply gorgeous and some of his very best, filled with atmosphere and detail. Best of all, the two of them have crafted a tale both satisfying, yet leaving the viewer wanting more. With the implied backstory and supporting cast, there's plenty for them to mine for further tales. I, for one, would welcome them. Since this was a Kickstarter funded project, the availability of the book remains elusive to non backers. I know there were extra copies printed. Your best bet is to visit either the official website or read the information on this indiegogo page for information on how to obtain a copy. Colin Dickey doesn't care whether ghosts are real or not. That's beside the point. 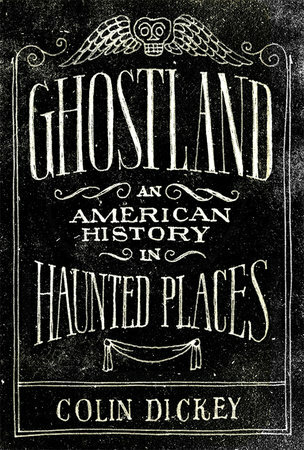 What is interested in is what stories of alleged hauntings say about us, about our connection to place and history. When facts are easy to uncover, why do the stories of hauntings continue to perpetuate false information about the alleged spirits, or the places they are said to occupy? 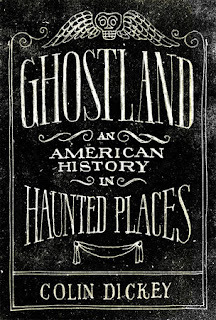 Why are the ghosts of Hollywood only famous people, or the ghosts of areas once the home of atrocious slave markets only haunted by white people? 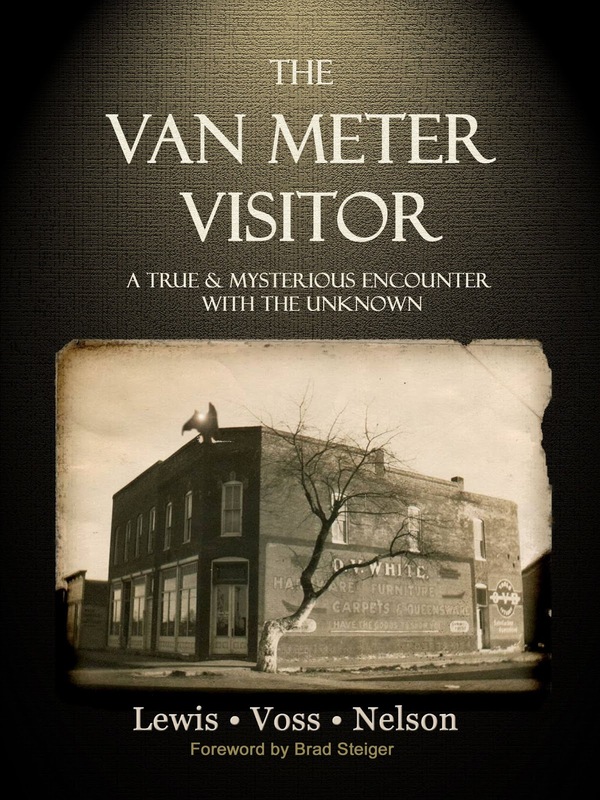 This book is extremely fascinating, and Dickey has a relaxed, yet authoritative writing style that delivers the goods whether covering the Winchester mystery house, the Danvers State Hospital, the ruins of Detroit, or the internet. This is easily one of my favorite books this year and a valuable addition to my own library on the supernatural. In the realm of fungal horrors, "The Voice in the Night" by William Hope Hodgson is, understandably, the first thing that comes to mind. along with the excellent movie based on it, Matango (1963). 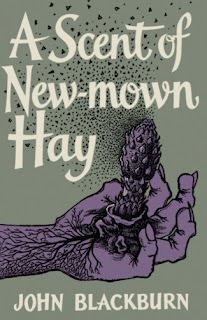 In 1958, John Blackburn made his literary debut as novelist with a genre crossing foray into the fungal horror sub-genre. 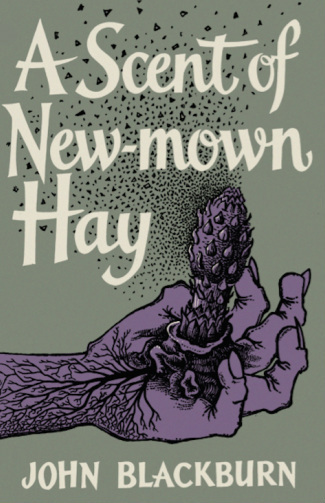 A Scent of New-mown Hay us a rapid based espionage thriller featuring a scientist and his wife as they race against the clock to stop a potential epidemic of global devastating potential born out of a Nazi hybridization program. The program aimed to create a lethal form of mushroom that would use its spores to infect and transform human beings into mobile fungal abominations. The novel is brisk and concerns itself more with the solving and prevention of the epidemic than it does with the shambling horrors that the spores create, but is exciting nonetheless. I'm amazed this has not been adapted for the big screen, yet. Moore provides ten tales, mostly centering around Halloween, and about half of which interconnect in their setting, and in a couple of cases obvious shared mythology and characters. These stories are all treats with dark tricks enclosed. 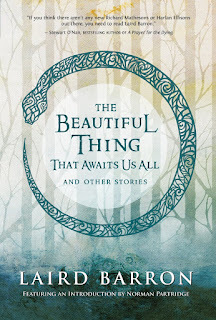 These are not feel good stories, but dark gems which usually end badly for the protagonists. In spite of the connective nature there is plenty of variety here. 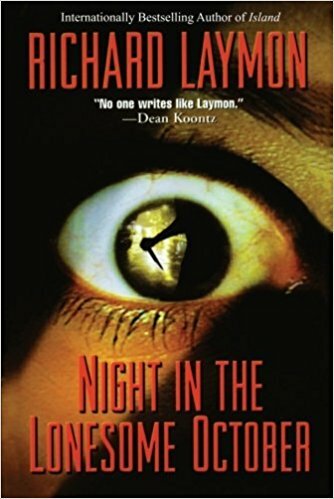 A group of trick or treaters who pick up a stalker once they pass the former home of man who had done unspeakable acts to children; a man who retires to an idyllic community with its own sinister Halloween tradition; a poisoned forest haunted by a malevolent family; a lost boy rescued by a much too helpful stranger; a group of kids who venture down the wrong road on Halloween, and more. This wound up being one of my favorite books this year and I highly recommend it. The only gripe I had with it is an apparent lack of a proof reader. The book is riddled with typos, enough that I felt bad for the author and hope that they will be corrected for future editions. 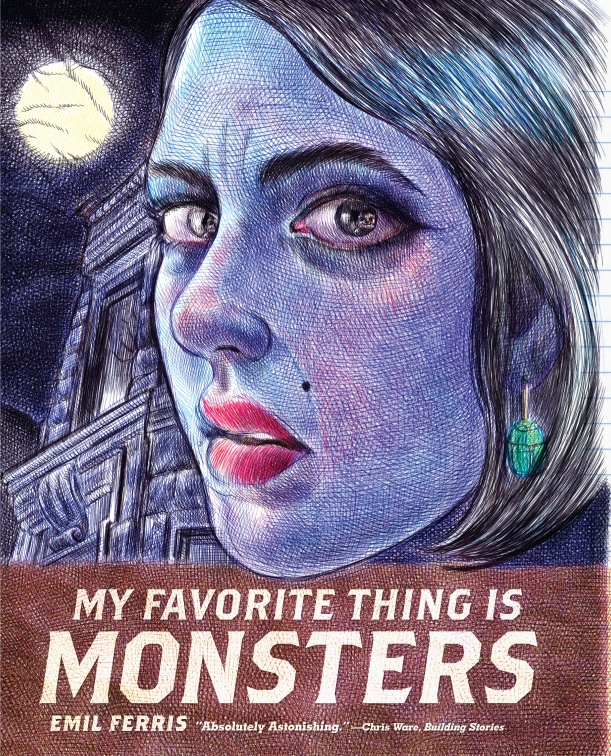 My Favorite Thing Is Monsters is a narrative told by Karen, a 10-year old girl living in Chicago at the end of the 1960s. Karen's favorite thing is monsters, in fact she portrays herself as a female version of Eddie Munster instead of a regular girl, and hopes that a real monster will come along and fully transform her and her family so that all of their problems will be solved and they can live forever. But while the monsters of late night television movies are her safety net against the complications of her own life, other, real, monsters intrude. A woman in her building dies mysteriously of a gunshot wound. Was it suicide, or murder, and if the latter, who committed the act? She decides to unravel this mystery and uncovers secrets involving underage girls being used as prostitutes, nazi death camps, and more mysteries. She encounters discrimination against race, sexual orientation and class. Criminals, would be rapists, back stabbing friends, and cancer also exist as part of her life. My Favorite Thing is Monsters is an astounding piece of work, let alone as a debut. The art is absolutely stunning and the writing matches it perfectly. Layered and complex, with well rounded characters, it's completely involving. Part 2 arrives in February 2018. and I can't wait. One of the first foreign translations of Bram Stoker's classic novel, Dracula, was published in Iceland (for reasons contained in this book). What's particularly interesting about this translation is that it is not a direct translation of Stoker's novel. Why and whether or not it came from a different draft of Dracula is still a mystery. 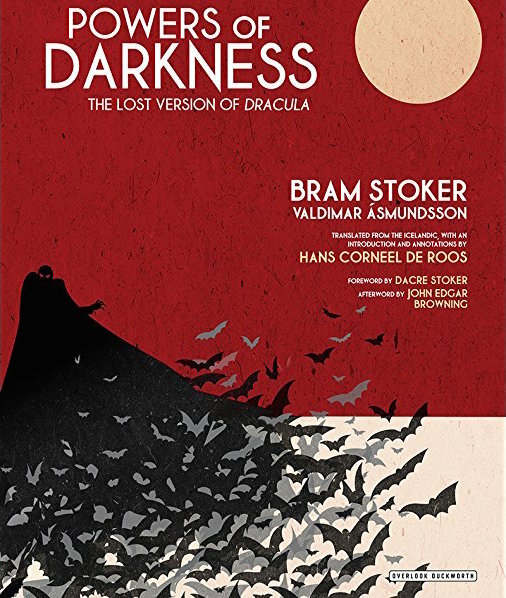 Most of the novel, now titled Makt Myrkanna (Powers of Darkness) by Valdemar Asmundsson takes place in Dracula's castle as Dracula and Thomas Harker match wits and Harker comes to understand that his fate will not be a pleasant one. Dracula is conversational. He has a housekeeper. There are not three vampire brides, but a single beautiful woman in white who continuously appears trying to seduce Thomas into removing the crucifix from around his neck. There are weird strangers and the meeting of a blood cult deep beneath the rotting castle (which Harker explores at great length). It is very different in tone and structure. The epistolary nature of Stoker's version is eliminated, so that Mina (here Wilma) is mostly absent and not ever present through letters and diary entries. Even stranger, this section of the novel now takes up five-sixths of the full length of the book. Everything else (also different) is wrapped up in a succession of quick short chapters that make up the rest of the book. Peabody Essex Museum/Skira Rizzoli. 2017. 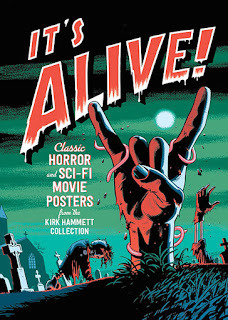 Metallica guitarist, Kirk Hammett, has one of the best collections of horror memorabilia out there. It contains some truly astonishing items, and now (through November 28) much of it is on display oat the Peabody Essex Museum in Salem, MA. This book serves as the exhibition's catalogue. and is a visual feast for the eyes, and the senses when you realize just how colossal some of these movie posters are, and how unique (literally in one case) they are. 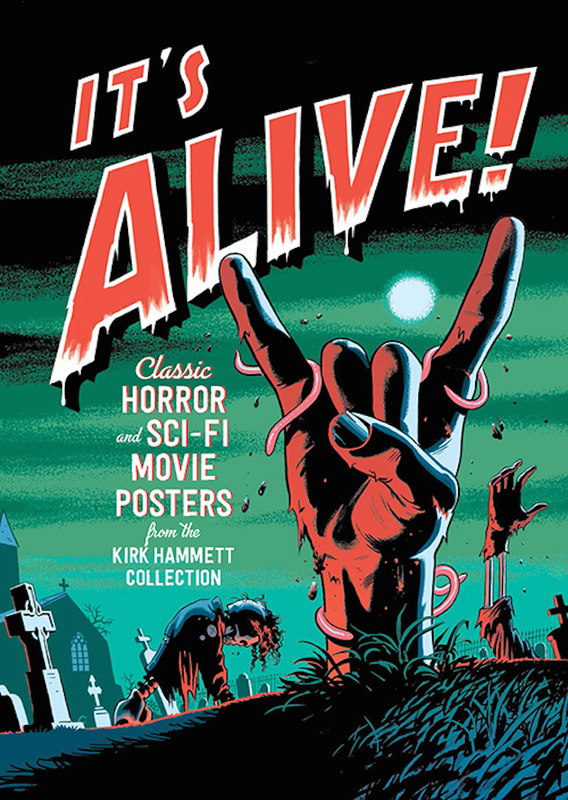 Accompanying the images are essays on the lure of the horror movie poster, fear and its attraction, and how horror can inspire one's art as it does for Kirk Hammett. Although there is, obviously, a lot of overlap in terms of the visuals with Hammett's previous book, Too Much Horror Business, It's Alive! makes for a worthy companion. 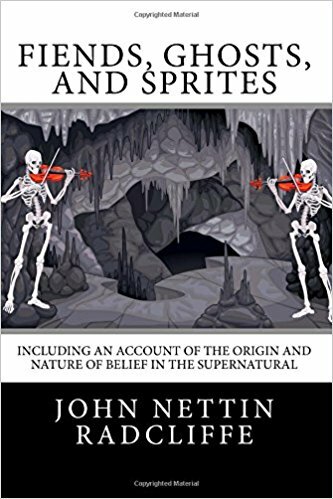 Radcliffe takes us on a journey through the relationship between man and supernatural beings, particularly ghosts, from the dawn of humankind through pagan beliefs and religion, christianity, and, then modern, psychology and physiology. For a book of its time, and while Radcliffe is firmly a religious man, this book is completely skeptical of supernatural beings. Radcliffe takes the time to explain how these beings tied into the relationship humans had with the world around them, how gods were demoted to spirits and demons after christianity became the dominant western religion, spends time in other, non-western cultures, and compares similar tropes common to numerous cultures. He then takes on ghosts, sightings, table rapping, hauntings, etc., and applies what was then known about the senses and psychology to explain them away as figments of our imaginations and senses at work. 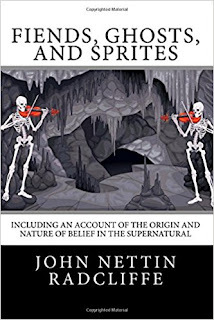 Radcliffe's style is a bit dry and much of the material feels like a quick survey rather than an in depth study, but the book remains fascinating in its skeptical and analytical approach to supernatural phenomenon, especially given the time that it was written. If you have an interest in this sort of thing, this is definitely worth a look. 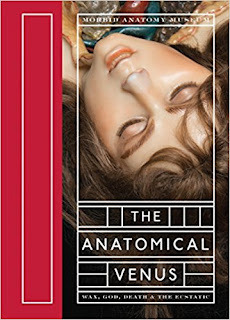 Created as educational displays and as an anatomical alternative to dissections of actual dead bodies, the anatomical venus was a, typically, life-sized wax mannequin of a woman in repose, whose torso could be opened to reveal her inner organs, which were also often removable, down to the fetus models featured no matter whether the figure was demonstrably pregnant, or not before opening. 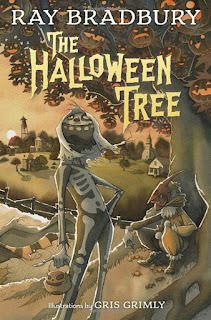 Whether this book should really be included here on a list of recommended Halloween reading is debatable. For some people a book full of glorious color photos of realistic wax figures with their inner structures on display would be considered a macabre text appropriate to the season. I find the models displayed alongside Ebenstein's informative text to be incredibly beautiful. I would love to have one of these on display in my own home. Whether you agree, or not, this is a gorgeous volume on a peculiar area of medical science and historical public exhibitions on the anatomical arts. Catcall takes us on a tour of thirteen creepy locations, effectively evoked through his precise descriptions and beautifully unsettling art. 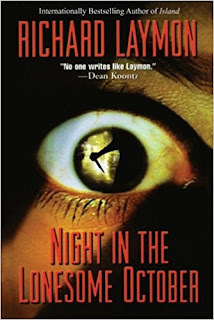 There is no narrative to speak of, but, as Catmull suggests, this the perfect book to read "alone late at night in the dark far away from civilization, preferably during a power outage." I pull this book out to read periodically, and it never loses its power to fascinate and disturb. 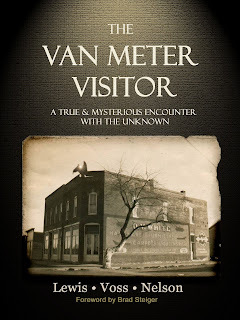 Over a couple of nights in 1903, the small town of Van Meter, Iowa, found itself disturbed by the presence of an eight-foot tall bird-like creature, with bat-like wings, four-legs, and a bright light which shined from a horn-like protrusion on the top of its beak. It caused no harm, but was shot at repeatedly to no avail before vanishing (along with a second, smaller creature) into the town's mines. The entirety of this strange experience was initially related in a single, short, newspaper article that was published at the end of the events listed above. No follow up was ever recorded, so there's no way to know if that was the end of the story. The authors of this book deserve credit for taking what could've been a single paragraph, or foot note, in a more expansive book on weird phenomena, or cryptozoological beings, and making a full book out of it. They did what research could be done over a hundred years after the related events, and for the most part, provided sound analysis. The part for me that I have issues with in books such as this one, is when they start getting into areas such as "ultraterrestrial" explanations, conjecturing that strange creatures, such as the one being investigated, could possibly be visitors from another dimension. It's hard enough to try and identify a mysterious creature using behavioral and biological bases, but when you are taking a creature not proven to be real and using theories about parallel universes which are not proven to be real, to account for them, you're building a case lacking any solid foundation. Especially so, when you've already gone to great lengths to relate your careful, sound investigative techniques and analysis. Don't get me wrong, parallel universes and the collective consciousness are fascinating to me, but risk erasing constructed credibility because they seem like entirely speculative conjecture, and probably sound a bit crackpot to the lay reader. A very interesting read, though. Thirteen types of ghostly tales by Sahu are collected here. A tale of just desserts, revenge and vegetables, magic candles, la llarona, a rambling house, etc. There a couple stories here that are murder tales vs. ghost stories, making them the "other unpleasantries" of the title. Sahu has a style that suggests these stories would be at home as part of a television anthology series. There's nothing particularly dark, or sinister about her presentation. They feel more 4:00 in the afternoon on a pleasant day than 2:30 in the morning on a stormy night. This is what catches you off guard. While there are a few tales here that are more charming than churning, many of them take a wicked turn and come to a truly dark finish. I'd never heard of Sahu before picking up this book, but I'm glad I found her. Sam Specter is a ten-year-old ghost who fancies himself a private eye. He lives in Netherworld City, a vast metropolis inhabited by all manner of supernatural being. Like most kids his age, Sam has the usual problems; homework, bullies, adults who don't believe some of his accomplishments in the world of private investigation. 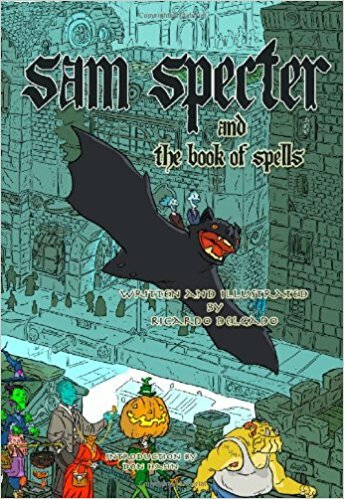 Currently he's working two cases; finding the lost guitar belonging to a member of Netherworld's most popular band, and recovering the Book of Spells, a powerful grimoire, stolen by a gang of monsters performing the bidding of a much greater evil. Delgado, an accomplished comic book and concept artist crafts three-quarters of a really enjoyable book. Most of the problems are first time writer problems that could have been solved by some good editing. Important scenes take place between chapters, supporting characters could have stood more development and purpose in the story as a whole, and there are a lot of descriptive passages pertaining to the architecture and furnishings of Netherworld City that aren't going to connect with the age group this book is aimed at. Once the story gets rolling it is fast paced, action packed, suspenseful, and very entertaining. Given Delgado's background, I think it would have been more successful as a graphic novel, or as a more fully illustrated book. As is is, beyond the cover, there are only tiny thumbnail sketches at the top of each chapter and these do not convey the true ability of the author, or really provide the reader with helpful visuals to latch their imagination on to. I'd like to see more adventures of Sam Specter, but hope that Delgado gets some editorial guidance to bring his stories to their fullest potential rather than the almost there story that this first outing is. 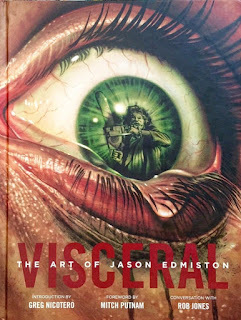 Jason Edmiston is one of the masters in the pop culture art explosion of recent years. He's uncannily tackled many icons of the big and small screen, not all of them horror icons (he's also painted Batman, Star Wars, and Transformers characters as well as Willy Wonka, Pee-Wee Herman, and some Disney characters to boot), but his emphasis has been on the darker side of the silver screen. This book is full of monsters, a thick tome of Frankensteins, Freddys, Creatures, Predators, Aliens, Kongs, Jasons, etc. 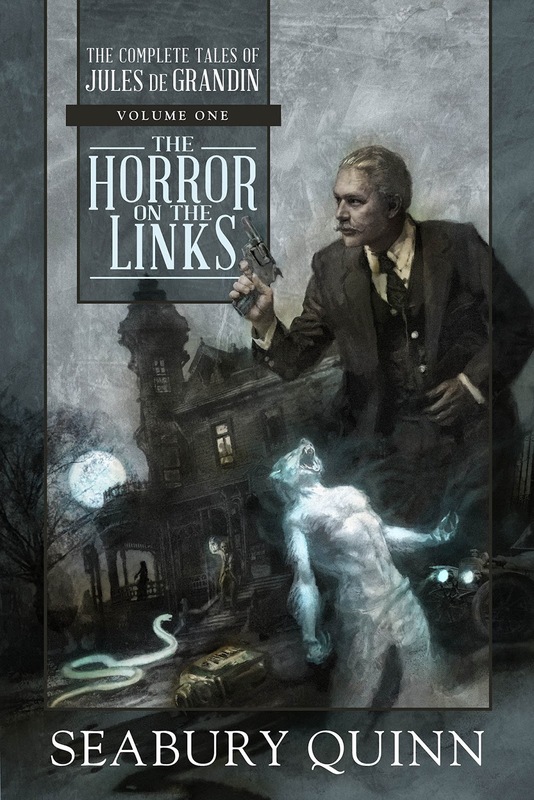 If you love art and horror, this book is not to be missed. 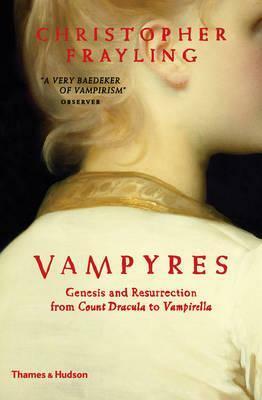 This expanded edition of Frayling's 1978 book is indespensible to scholars and fans of vampire fiction alike. Grayling traces the origins of vampire fiction back to its origins in folklore and its actual birth on the night of June 17, 1816, the same fateful night and location where Frankenstein was born as well. Grayling surveys dozens of stories between then and the creation of Bram Stoker's Dracula, taking some side trips along the way and presenting excerpts, or entire stories that exemplify the evolution of the vampire tale between John Polidori's The Vampyre, and Stoker's more famous creation. Always fascinating, which is a real feat considering the amount of scholarship covering the night of June 17, 1816, as well as Stoker's Dracula, Vampyres provides some rare treats, essential reading, and concludes with a story by Angela Carter, which has its origins entangled with Frayling's research for this book. Craig Yoe continues his outstanding series of books collecting pre-code horror comic treasures that have fallen through the cracks of time. All are outstanding. 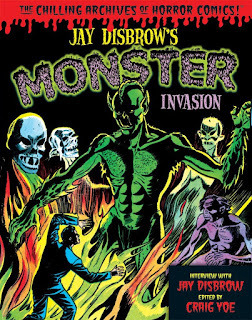 This volume dedicated to the works of Jay Disbrow is no exception. Disbrow's art is energetic and disturbing in it's almost naive, off-model carnival spook house style, which is a selling point, not a criticism. The stories are fun and have the feel of independent, low budget horror movies of the 60s, but with better monsters. You also have to give him props for selling the exact same story to two different comic book companies which published them only a couple of months apart (both versions are included). Live right Publishing Corporation. 2016. 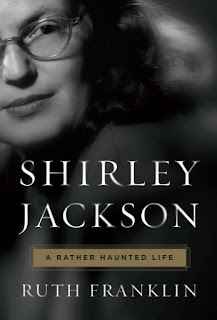 When Shirley Jackson entered the hospital to give birth to her third child. a hospital clerk asked her her occupation. "Writer" she said. "I'll just put down housewife, the clerk replied. In her world, that's the role that women were expected to fulfill. 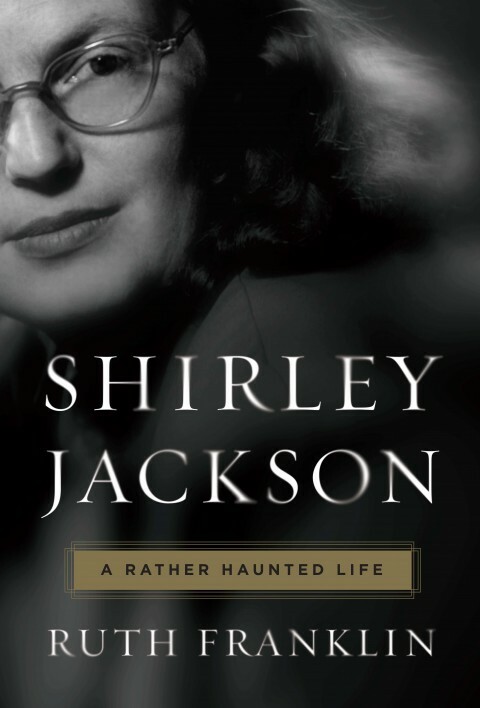 The celebrated author of "The Lottery" and The House on Haunted Hill, spent her adult life trying to balance being a homemaker and a writer, while suffering the constant harsh criticism of her mother, and the demanding needs of her distant husband. Franklin's examination of Jackson's life and career is rich and superb in her manner of relating it. This is an excellent biography about a very influential, if troubled, writer. 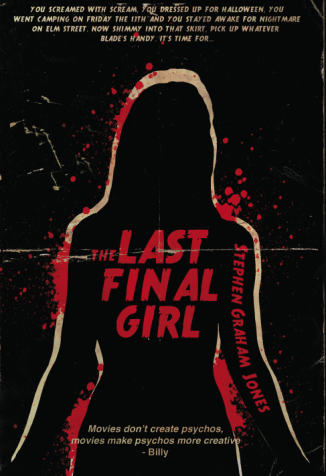 Lindsey, a final girl who has survived a massacre at the hands of a killer in a Michael Jackson mask returns to high school in time for homecoming, and fills out the now empty slots of her murdered entourage with the school's misfits. One of those misfits, Izzy, recognizes that this is the formula for a "sequel" and that she and the rest of Lindsey's new clique, were chosen as fodder so that Lindsey can end up as final girl once again. It would be simple, and inaccurate, to say that Jones embraces all of the tropes of the slasher film and spins them on their heels in order to throw the reader for a loop. That is an important component here. Jones is aware that the reader probably knows all of those tropes too, dropping in references both obvious (characters named Jamie Curtis and Crystal Blake) and slyly descriptive shorthand to horror fans (the killer does a "Hodder" when looking at a victim), including cameos by horror actors as supporting characters, but what makes this book sing is Jones' narrative style. The story is told as if someone were describing to you a movie that they were watching, dropping the usual descriptive prose with quick snapshot descriptions of visual and aural edits; establishing shots, quick pans, compositions in which an empty space behind a character looms suspiciously in frame, jettisoning a lot of unnecessary description in order to cut the story down to its meat and potatoes. For all of that, the relationships here feel more real than in one of the movies it emulates, and scenes of loss are more cutting for that. 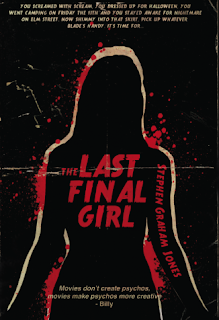 I'm not a real fan of the slasher subgenre, but found this book to be a very entertaining read. 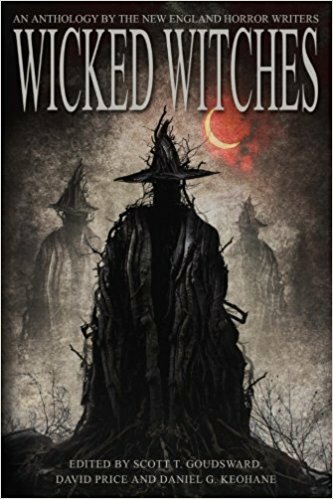 Wicked Witches edited by Scott. T. Goudsward, David Price and Daniel G. Keohane. As a longtime resident of New England, I've always known that this corner of the USA was darker, more atmospheric and haunted than any other region. This probably accounts for why so many horror writers can be found here. 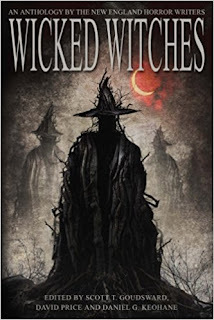 Wicked Witches is a themed anthology of the New England Horror Writers. The writers included range in styles, experience and skill levels, so the stories range as well. There are a number of very entertaining stories here, a couple chillingly effective ones, and no real duds. 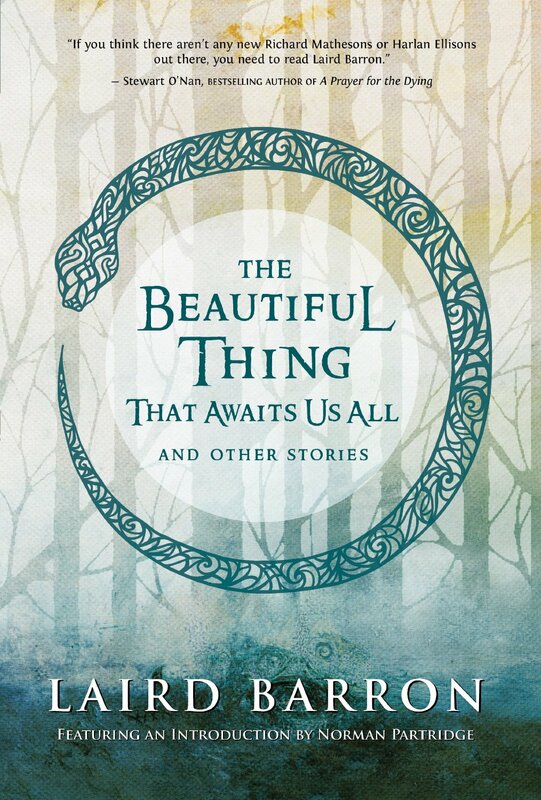 Kudos also for the variety of tales told here given the thematic nature of the anthology. Even so, it's probably best to space them out a bit rather than trying to read this straight through, something that can be said for most anthologies. Even just dipping randomly into this volume will give you something that will help make the season complete. In a vast savannah habitat in central Florida, that is part of a now closed military base, three groups compete for ownership of this untouched, remote land; a Walt Disney-esque media company looking to expand their idealistic suburban community named Salutations (much like Celebration), a retired Marines colonel who wants to use it to train right-wing militia groups in preparation to step in and overthrow a left leaning government, and a billionaire ecologist/cryptozoologist who wants to keep it as is. When dogs go missing from the outskirts of Salutations, Ron Riggs, a Fish and Wildlife officer, is brought in to investigate. What he finds is romance, intrigue, red herrings, murder, betrayal and 10 foot tall prehistoric birds with strength, speed, razor sharp beaks and some other surprises. This is an adventure novel which isn't so much of a throwback to nature's revenge novels popular in the 1970s, though it is patterned on them. The characters come in familiar clothes; the scheming, selfish corporate leader, the crazed ex-military man, the environmentalist, the heroic everyman, the tough girl, the meddling reporter, etc. As the book progresses and the characters you think are definite bird fodder, turn out to be other than, and the climax appears and ways other than what you expected, you realize that there are other red herrings than the ones being served to the characters in the book. 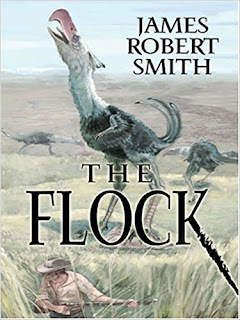 This was a fun, fast paced read, and Smith pulls off the unenviable task of having to convey to the reader the inner workings of an alien species. A sequel is in the works, and I'm looking forward to reading that one, too. 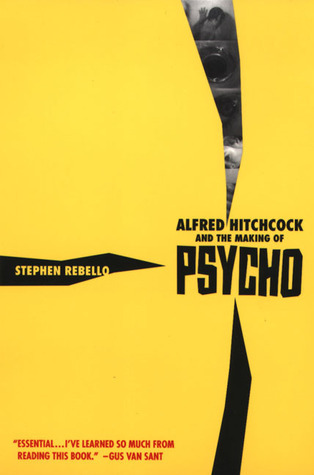 Alfred Hitchcock's Psycho was a grisly film that no one, aside from Hitchcock, himself, wanted to see made. This economical thriller would take the box office by storm, redefine Hitchcock's career becoming the film he would never surpass and later a classic. Rebello's book charts the making of this pivotal film from the events that inspired Robert Bloch's novel from which the film was adapted, through studio politics, preproduction, filming, release and its aftermath. told with precision and insight and with the valuable input of the surviving members of the cast and crew, this is a remarkable behind the scenes look at an essential piece of cinema. 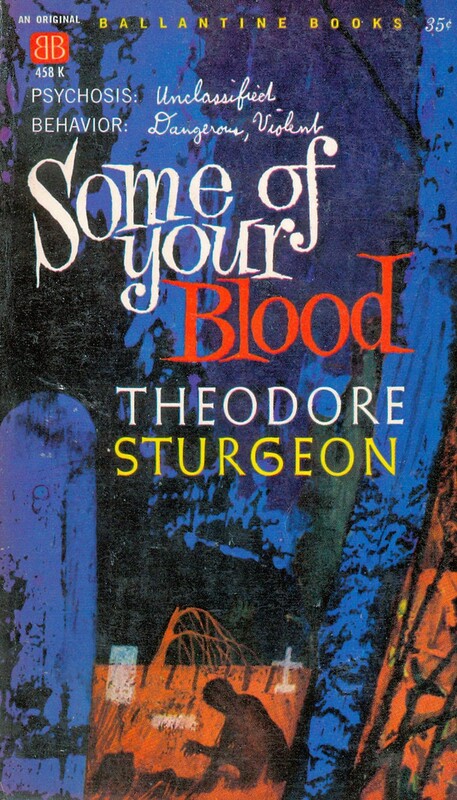 Theodore Sturgeon is best known for his science fiction stories, but crossed genres often. Here, using the same epistolary technique that Bram Stoker used for Dracula, he updates the vampire story to the modern era in a subtle story that chooses disturbing psychology rather than supernatural origins to explain the root of his vampire's cravings. Now, much of what appears here, including similar profiling as used with serial killers, will appear old hat, but in 1961, it must have been fascinating. 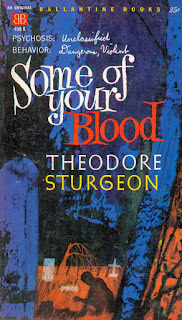 Sturgeon is a master storyteller though, so this quick read still remains entertaining, if not blood curdling. Young Iris Vallarca, the last of her line, is kept isolated by her father at their ancestral mansion, Rawblood. The reason he keeps her there and away from other people is that the house seems to be the only place where their unique disease, Horror autotoxicus can be kept in check. This same disease, she is told, took her mother and has caused early deaths for every other member of their family. As Iris grows up, her suspicions that this unique disease might not even be real, seem to be confirmed, but the alternate explanation for what's causing the deaths at Rawblood is far more sinister. This is at once a classic gothic tale rich with secrets and atmosphere and a compelling, dark character study. It pushes the characters and the reader towards more and more disturbing revelations until it's punch in the gut climax. This was really outstanding. 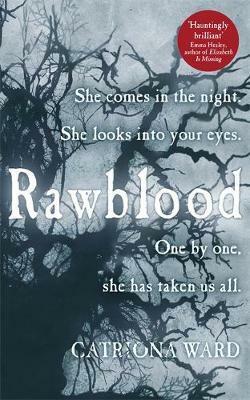 The book has been retitled as The Girl from Rawblood for American release. 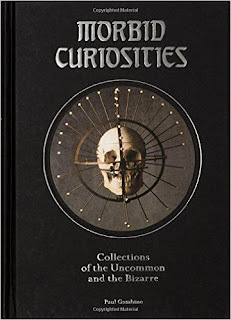 If you have an affinity for the bizarre and macabre, this book is a must. 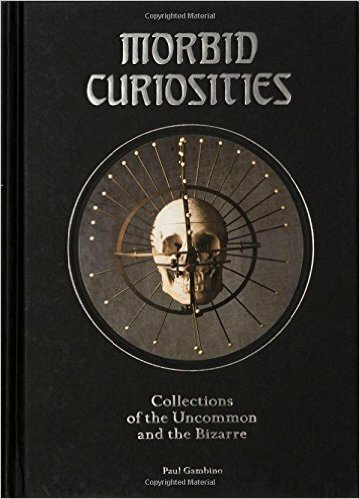 This is an examination of the collections of seventeen individuals who have filled their living spaces with all manner of memento mori; skeletons, anatomical models, photographs of the diseased, misshapen, and dead, gas masks, serial killer memorabilia, preserved specimens, medical tools, and taxidermied specimens, both normal, monstrous, and anthropomorphized. The photos are glorious, the collections astonishing, and the stories of the people behind them just as interesting as what they collect. 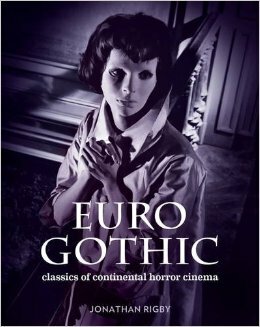 If there's one area of horror cinema that I know the least about, it's the films that came out of continental Europe. Too many movies had very similar titles (or multiple titles) with quality varying widely and extremely. The best known directors had very inconsistent quality within their own output. Films weren't as easy to come by either. The whole regional genre output seemed like an impenetrable maze. Now, with Rigby's new book, I have a map. Focusing on the countries of Germany, Italy, Spain, and France from the dawn of cinema through the mid 1980s, this is a comprehensive examination of key (and some utterly disposable films) from this region of the globe. Like me, you'll probably want to keep a list of movies to find while reading this. 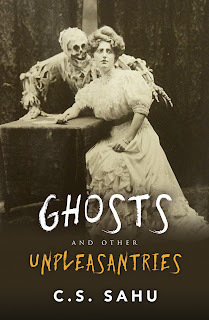 If you've read Rigby's other two regional studies, American Gothic and English Gothic, as well as his Studies in Terror, you'll know that his research and observations are outstanding, and that these are essential books for fans of the horror film. If you haven't read any of them, then acquire them as soon as you can. You'll thank me. When you see Ellen Datlow's name attached to an anthology, you know you are looking at a quality collection of stories. Nightmares is no exception. 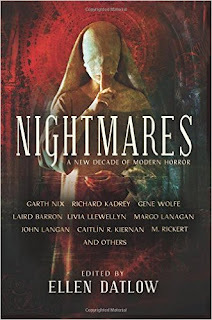 Organized by year of publication, Nightmares contains what Datlow considers the cream of the crop in horror fiction published between 2005-2015 (there is also a companion volume, Darkness, which covers the years 1985-2015). 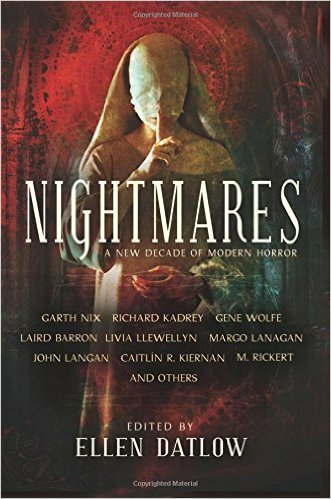 Authors include Laird Barron, Caitlin R. Kieran, Stephen Graham Jones, John Langan, Gene Wolfe, Gemma Files, Garth Nix, and other notables. There are twenty-four stories in all. Like any anthology, there will be stories that strike a chord with you, and others that don't do as much. There were no outright misses for me in this anthology, but several that made this one of the outstanding collections in recent years for me. Among my favorites involve a mysterious phenomenon that cuts off a house from its neighborhood, an apocalyptic being kept sequestered in a safe house, and a book thief and an atlas of Hell. Your own favorites will probably differ, but feel free to post them in the comments section below. Nine stories by Laird Barron is a great way to begin this season of darkness, and here you get two fistfuls of unsettling cosmic dread mixed with crime and the every day. What I like about these stories is that in most of them, Barron takes his time getting to the weird stuff, but even while he's setting up characters going about their every day jobs and concerns before they encounter that which will change them forever, that malevolence is there in ambient form. While the stories all stand alone, you'll discover common elements like a sinister black hole in the air looking back at you that makes it seem that it is the same darkness that is moving through this world highlighting examples of its dirty work for us to witness. That the stories themselves don't conclude with neatly wrapped up endings enhances that feeling that the bad stuff keeps rolling on. I highly recommend any of Barron's work. Also, kudos, to Norman Partridge for his entertain introduction. Welcome to my 2017 Halloween Countdown. This is my twelfth annual Halloween Countdown. anthologies, single author short story collections, novels, macabre non-fiction, biographies and graphic novels are all represented. Like last year, I've decided to only include books I enjoyed and to showcase authors that don't get the same amount of love and attention as the genre heavyweights. Because I really like to go into a book knowing as little about it as possible, the reviews are pretty general and as unspoilery as I could make them. Some of the books work incredibly well if you have no idea what they are about before starting them. Most of the books I chose are also pretty easy to get your hands on, and I've even provided a handy link on each post so that you can order the book from Amazon. Please use this link. If you make a purchase from Amazon by visiting through those links (even if it's not the item in question) Amazon will throw some revenue my way. It's hardly a noteworthy amount, but can cover the cost of a book or two that I purchase later on. I recommend doing this on any site that provides a link to something that the creator of that blog has steered your way. Think of it as a tip jar for being directed to quality entertainment. Also, be sure to visit my companion blog, The Grim Gallery for all things monstrous 365 days a year. I'm not alone in running an annual Countdown to Halloween. After you are done here, please visit Countdown to Halloween where you will find links to hundreds of blogs hosting their own countdown this year. If you want to be part of that group, information on how to do so can be found at that link as well. There's nothing better on an Autumn night when the temperature is down, and perhaps there is wind, and even better, rain, than to curl up with a good drink and a spooky book to usher in the season. Hopefully, this countdown will make it easier for you to choose what to read next.